What is so interesting about VietBet is that not only has it tailored itself as a full-service gaming operation that caters to those U.S. residents who speak Asian as a native language, it also has enough choices and amenities, including their offering of Bitcoin as a viable way of making deposits and opening accounts, that it qualifies as one of the most complete gaming destinations in the world, no matter what language you speak. There is so much to do here that it is astounding. 35% up to $1000 Play Now! There is a load of online gaming experience put to use here; VietBet was established back in 2002, and it is backed by one of the biggest operations in the world, which has been around since the 1990s, which is forever in this industry. This is a component of VietBet that is loaded with features. As we mentioned, reduced juice allows for better odds. So if one had to lay 11-to-10 on, say, a football game, that price could be reduced to -105, which brings great long-run savings. There is virtually nothing you can’t wager on. Aside from the major team sports in North America (baseball, football, basketball, hockey), there are the individual sports like tennis, golf, boxing, MMA, and auto racing, plus every relevant international soccer league in existence. And that’s just part of it. Customers get great prices on exotic wagers like parlays, teasers, reverses, round robins, et al, and if you are looking for daily propositions or futures, you’re not going to find any place where you’ll have more at your disposal. Here is another feature that will keep you coming back. 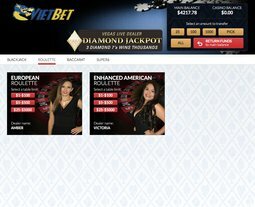 VietBet has beautiful dealers standing by in a brick-and-mortar setting, waiting to deal out the game of your choice, whether it be blackjack, roulette, baccarat or the innovative variation of Blackjack Early Payout. It’s all powered by VisionaryiGaming, and it is delivered via a live, high-definition video feed. Everything is done in real time, so you can socialize with the other players and the dealer. There are a number of alternatives available to make a deposit, but Bitcoin, the virtual currency, is the most attractive, because it is not only the fastest method, using their automated system, but it also NEVER carries a transaction fee. And it goes without saying that by dealing directly with VietBet, no financial information has to be shared with a third party. Customers can deposit with Bitcoin and then play in US dollars. Then they convert back to Bitcoin when they cash out. And those payouts come on a “same day” basis from Monday to Friday. You can play poker at VietBet, in a room powered by the respected Grand Poker Network, and it features 50% Daily Rakeback. 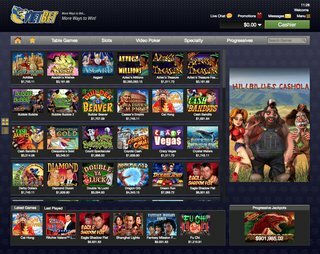 The casinos use games produced by DGS, Betsoft and also RTG, where customers can look forward to playing the critically-acclaimed “Real Series” slots. They do not require a download. And there are regular tournaments that are held for casino players to compete against each other. One of the unique activities you can engage in is the daily lottery, as you can bet on any state’s Pick 3 or Pick 4. This is something you are definitely not going to find in many US-facing Bitcoin casinos. Every time you turn around, there is seemingly another different product or variation made available that can greatly enhance the overall experience. The site has gone through a re-design but one thing has not changed, and that is the user-friendly interface that does nothing to confuse or intimidate you. It is mobile-friendly too, and that is important when you have so much to offer. Sportsbook customers get a free play bonus with a very reasonable rollover, and there are a number of things that can make any visit special. If you are a sports bettor, reduced juice gives you value by offering better odds, and then after an event begins, you can place wagers on it while it is in progress. There is an incredible amount of variety, and that includes three different casinos, a “plus 10%” Racebook, and a poker room. They are working on special promotions all the time, and customer service is available on a consistent basis to aid customers in a number of different languages – Vietnamese, Mandarin, Cantonese, English, and Spanish. And you would have to go a long way to get paid quicker than you can by these people. Obviously that’s important. This is most definitely the “go-to” destination for Asian customers in the United States. Contact them through the website or at 1-800-986-1154 and be sure to mention the bonus code BTC35 good for a 35% Welcome Bonus. Get a $1000 Welcome Package Now >>> Play Now!